Bago po yan... sa mga hindi pa nakaka alam. Wag po tayo gagamit ng VPN sa pag DDL, dahil malaki po chance na ma-block ang sim mo! Kaya dapat ito gawin nyo kung gusto nyo mag DL ng Up to sawa! Sim card -> Mahalaga ito kung ano dapat mong gamitin. base sa aking exp. yun mga luma sim eh. mabilis ma-block, Lalo na kung naka VPN ka. tapos nag DDL kapa! Sure one shot block yan sim mo. Bale 2 sim na ang nablock na sim card ko. May mga nag sasabi na ang bilin daw na sim e yun Polka dots na smart? Meron ako nun, nitry ko. gamit ko Butas Trick o FreeBrowse. So ok sya.... Pag gising ko ng Umaga... Ayun Block agad... Hays! So ang gamit kong sim ngayon e yung Retailer Sim o ... o mas kilalang Eload sim. 1.8GB po yan ni DDL ko..
Eto po yun Video na mabilis lang mag connect sa smart. - Credits for the (real) person who cracked HSS Elite. 2. Hit connect (app) of the extracted folder. While in connecting state after 15-30 seconds or more, may papasok na maliit na KB (mga 4-20kbps na tuloy-tuloy) sa dashboard, hit disconnect (app) (Kung naging connected ang HSS, idisconnect lang at maga'auto exit din yan.) of the same folder. (1). While in connecting state (HSS) after 15 mins or less, huwag idisconnect. Itry nating magping sa google gamit ang CMD. 4. Kapag nagping na, start browsing, downloading, and uploading w/o limits! 5. Dapat, FULL ang signal ng dashboard para maachieve ang maximum speed ng Smart. 6. Make sure na Smart Broadband Incorporated ang ISP mo. Dahil kung EGIhosting, hindi yan miracle, NAKA VPN KA! 7. Kung gusto mong mag-online ulit, do the same steps. 8. Kung hindi kumuha sa first try, disconnect both dashboard and tunnel, Then do the same steps (again). Always remember, PERSEVERANCE is very important. this is all tricks which I combined to make connection to Globe Magic IP easy. auto ip finder po siya plus modified proxifier plus pinger modified to speedtest. 1. change the name of your connection na gagamitin to "GlobeMagicIP"
Create your own promo New! and sa other na naka tulong din. 2. Select network and enter mobile number. 3. Select promos/combination "Ex. UAT1400 + UAT350 + UAT150". Then click "Send". 4. May mare-receive kana na message from 2888. This image has been resized. Click this bar to view the full image. The original image is sized 818x549. 5. Copy and Paste the links. Paste (CTRL + [N]) N = Number of link Ex. for link 1 (CTRL + 1), for link 2 (CTRL + 2), up to 4. 7. Wait mo lang mag reply ping. Pano malalaman kung bug kna? * pag katapos pindutin ang iBug button mag hintay ng 1-3 minutes. hintayin lang kung mag kaka roon na ng ping or open a webbrowser at i-check kung makaka surf na. Gano katagal o ilan araw bago ma unbug? * 1 to 30 days. May bandwidth limit ba kapag bug na? Why it is important to check links? Have you ever received an email from a bank , paypal , facebook or similar that required you to verify your personal information? Please watch out , in that email can be added unsafe link that will lead you to phishing page, that will steal your information . Link manipulation is making a link in an e-mail (and the spoofed website it leads to) appear to belong to the spoofed organization. Misspelled URLs, use of subdomains and making anchor text for a link appear to be valid and the link actually goes to the phishers’ site. Filter evasion is that using images instead of text to make it harder for anti-phishing filters to detect text commonly used in phishing e-mails. To check if a website link is safe without clicking on it, do this..
A Keylogger is a .exe that when it's launched it starts to send keystroke logs to the hacker that sent the file. The keystrokes can be sent via FTP or a email services such as Gmail, Hotmail, Yahoo, etc. The logs will be sent every x amount of time you set it to, 2, 3, 4, 5 minutes what ever time you set it to. The emails being sent will include what the Keylogger has as features. It can take screen shots of what the victim is doing, steal user name & passwords and obviously log keystrokes. 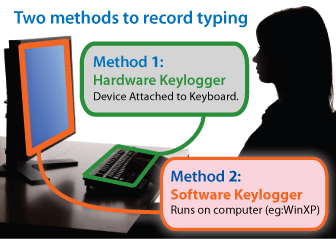 Keyloggers also have the function to Startup with the Operating System, so as soon as the victim logs on the logs start to send. An anti keylogger is a software specifically designed to detect keyloggers on your computer, comparing all files in your computer against a database of keyloggers looking for similarities which might signal the presence of a hidden keylogger. As anti keyloggers have been designed specifically to detect keyloggers, they have the potential to be more effective than anti virus software. Some anti virus software do not consider certain keyloggers a virus, as under some circumstances a keylogger can be considered a legitimate piece of software. - One of the obvious is, don't download random or suspicious files , or if you do use a Virtual Machine or a SandBox. - Keep your anti virus updated regularly & perform scans often. - Use key scramblers, these will encrypt your keystrokes causing the hacker not the be able to read your keystrokes. 1. Open Calculator, Start> Program Files> Accessories> Calculator or press Windows+R and type ‘calc’ in the run box, click OK.
2. In Calculator, go to Help> Help Topics. 3. Right click on the left hand side of the title bar and click on ‘Jump to URL’. This tutorial will guide you to verify your Paypal using Smart Money. 1. Go to your Paypal then under Profile, click "Add/Edit Credit Card"
2. Fill up the desired fields. In the Card Type Drop box chose MasterCard. 3. Before You click the "Add Card", Go first to your phone and look for "Smart Menu", Under it chose "Smart Money", then look for " Internet Txns"
4. Now back to your Paypal, this time you may now click the "Add Card"
6. After you received the code..enter it! then tick "Confirm Card "
Save and make it default!